Maker Pro: How Much Should I Charge? Assuming you’ve made it past the first question and there is a market for your product, you have to figure out how to price your product. Brian Burling of eMotimo has a really good breakdown of factors to consider. Overhead for your store (operational expenses). Volume – how much are you going to produce and sell. Distributor Markups – most distributors want to make at least 30 percent. Value – how much are your customers willing to pay for it. Both real and perceived (i.e. brand). There are two pricing strategies: mass market and boutique. This article will focus mainly on the first strategy since this is the one most used by electronics and gadget focused businesses. A boutique strategy works well when you have a highly customized product (like artwork) that is characterized by small market size and high profit margins. Sometimes you can choose which strategy you will pursue, other times the strategy is picked for you by your customers. You can also change strategies down the road, but it can be difficult to do so. Consider where you want your company to be 5-10 years in the future. If you want a small, hands-on business making artisanal products, you want to use a boutique strategy. If you want a large, multi-million dollar business that sells to thousands (or tens of thousands) of customers, you want to use a mass market strategy. Woodcut Maps is a great example of a boutique strategy. They sell personalized woodcut maps starting at $150. Originally they only offered pre-made maps, but it wasn’t until they offered completely custom maps that their business really took off. While this is a great product, it has a much smaller market size, but higher profit margins. Ero Gear offers wearable LED clothing. Because of the products high cost, they’ve focused on marketing agencies and high-end events. Since their competition is limited, they can charge a much higher premium when a customer needs to use their LED clothing for an event or marketing campaign. But…they have a fairly small audience. 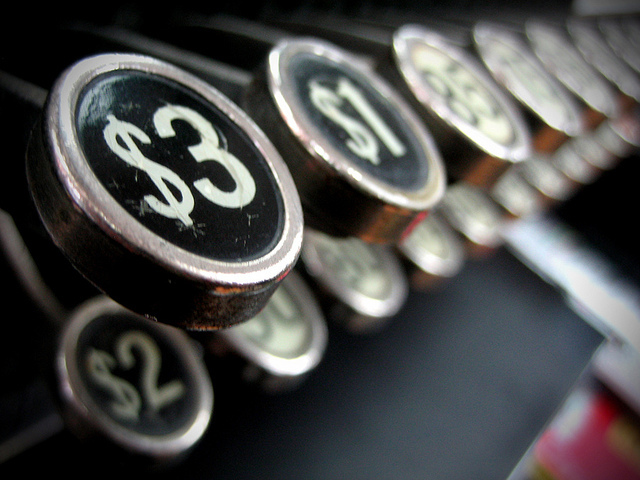 Boutique Pricing Tip: Charge as much as your customers are willing to pay. A mass market strategy involves getting other people to sell your product for you using distributors and value added resellers (VARs). It is also the most common strategy used by business-to-consumer (B2C) companies. This type of pricing strategy comes down to one important attribute—your cost of goods sold (COGS) or product cost. Everyone in the value chain that is selling your product needs to make a profit and still wind up with a price the end customer is willing to pay. This includes the distributor and the VAR. A general rule of thumb offered by several hardware entrepreneurs I interviewed was the ultimate retail price is around 4 X COGS. This means a product that retails for $100 cost the manufacturer $25 to make. Meanwhile, Chris Anderson of DIY Drones has said you should aim for a retail price of 2.6 X COGS. No matter which multiplier you use, your retail price will be driven by how cheap you can make your product. That same product that cost $25 to make would retail for $65. There is no absolute rule when using a cost multiplier to determine pricing, but yours will probably fall somewhere between these two numbers. Going with a mass market pricing strategy doesn’t mean you can’t sell your own products. However, you don’t want to sell your own products for less than your distributors and VARs can. Just consider the extra profit margin as a bonus. Mass Market Pricing Strategy Tip: Your retail price is driven by your product cost. I reached out to several entrepreneurs for real world examples you can use for your hardware startup. Here is their advice in their own words. Our product price was mainly determined based on the current costs associated with low volume production and a very serious consideration placed on the current market environment/customer perceived value. A person interested in the gTar might compare its price to the perceived price of picking up a cheap or second-hand guitar and getting a few lessons or learning from YouTube. We did research and found that the average sale price point of a traditional guitar is right around $390 (industry census data), so we tried to get close to this price. At this price point our margin is good enough for current operations and allows us to get some healthy sales which is key since over time we will be able to reduce our with improved production. I think the hardest part about pricing is product education, which in a way flows into marketing as well. In the case of our product this is especially prevalent since we’ve all seen those $99 guitars at Walmart or Target. It’s hard to sell a product that is far beyond current market options in that sense, while the gTar provides a value proposition significantly different than a traditional guitar. It’s the main pricing anchor point people have so our pricing decisions have to be grounded in this reality. We took a two-sided approach for pricing. We looked at our manufacturing cost in expected quantity (~1000) and wanted to come up with a 4x or 5x retail price. On the other hand, we looked at the price of similar items from the premium manufacturers (like Nikon and Canon) and wanted stay at 50-65 percent of their retail price. The two numbers gave us a ballpark price point to shoot for. Of course this is the retail price, coming up with dealer/distributor price is whole other (but more standardized) thought process. We’ve been selling DIY stuff for years, (it was) actually one of the initial reasons I started the company. We always wanted to have a product with a real consumer price, under $50, but in the early days we were just too small to get our pricing that low. So we started with Brain v1 at $199. Price is ALWAYS determined on cost. We don’t price things on how much money we want to make, we price them on what it costs to make them and operate our little company. With the DIY stuff we try to make it as affordable as we possibly can. So we really needed to design this to be under $50, not the other way around. Well the Brain v1 is $99, V2 is $189, so we’ve tried the higher end of things, and they sell pretty well (but they are expensive to make). We really wanted to make something under $50, a real entry level price, so we designed around that. To make sure a product is priced correctly, you need to figure out answers to questions like: What are comparable products that satisfy the same need, and what do those products cost? If my product will be more expensive, is it differentiated enough to get people to spend more to get something that (presumably) offers greater value? Put another way, is my product satisfying a $30 need, or a $200 need? You have to find out the answers to these questions before deciding on the retail price. We’ve done a lot of surveys and a focus groups to judge people’s attitudes about different price points – though it’s notoriously difficult to get good data from such “self-report” methods — what people say vs. what they do isn’t always the same, and there’s nothing like the ground-truth of actually selling your product at a certain price and finding out what happens! So in the end our price comes from looking at our COGS, surveying potential customers, studying pricing of other products in the market, and determining how much of a “razors and blades” bet we can afford to take – given that we don’t have as much money in the bank as a big company like Microsoft, Sony, or Nintendo. The pricing of new products (especially in new categories) is not an exact science, but these are some of the approaches that anyone making a product can use. First of all, you should be selling your product for at least 2x what it costs you and ideally more. This will allow you to cover the rest of your company costs such as overhead, new product development, sales and marketing, etc. (depending on volumes and exactly how much you make per sale). Your company’s brand also factors into this – for instance, are you trying to create a luxury brand? Is “best bang for the buck” something you want to hang your hat on? Brand considerations may skew pricing in one direction or the other from its nominal set point based on the feature set and price of competing products. We have evolved our products over relatively short time frames—months. When a newer version comes out, we tend to sell the older versions on eBay if we have excess inventory. We try not to keep much inventory. Pricing fluctuates also based on competitors. We try to keep similar products at a similar price, with our features being the advantage. If the competition changes pricing, you don’t necessarily want to change yours right away. There may be a reason why the competitor is suddenly cheaper – there may have been a defect or problem in some area. Best to dig a little before changing pricing. How did your price your product? What factors did you consider? Are you pursuing a mass market or boutique strategy – why? Let us know in the comments below. Stephen is a rocket scientist with an MBA who is researching how the maker movement is revolutionizing our world. For more info check out Stephen Murphey’s blog.